The issue of board independence figures heavily in David Koch’s Statement last week. It’s not his strongest argument. To take just two examples from the roster above, Ethelmae Humphreys has always struck me as a pretty independent spirit (there weren’t a whole lot of women running companies and fighting unions in the 1950s, when she ran operations at TAMKO Roofing Products). 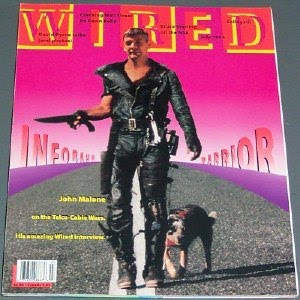 And Liberty Media Corp.’s John Malone—once depicted as “Mad Max” on a Wired magazine cover—is no shrinking violet himself. But, for the sake of argument, let’s assume all of these highly successful entrepreneurs and investors are “subservient to Ed,” given to wilting before the sheer force of his personality. They are still independent in one sense at least: they don’t depend on Ed Crane for their livelihoods. Does Kevin Gentry, a Vice President at the Charles Koch Foundation, “act independently” of Charles Koch? Does Nancy Pfotenhauer, authorized spokesperson for the Kochs and Koch Industries, just call ‘em like she sees ‘em, without consulting Charles and David Koch? Nominees to our board that the Kochs were unable to elect on March 1 include: the executive vice president of Koch Industries; a staff lawyer for Koch Industries; a staff lawyer for the Charles Koch Foundation; the president of a Koch-created nonprofit and former vice president of the Charles Koch Foundation; and a former Director of Federal Affairs for Koch Industries. I suppose it’s possible that Cato board members who work for the Kochs might, on occasion, overcome the limitations of human nature and forget who it is that butters their bread. But if the Kochs were really looking for board members who would “act independently from [Charles] or any other individual,” shouldn’t they have broadened the search? I am a long term Cato supporter. I have read over everything I can regarding the dispute between the Koch’s, Ed Crane, and the Cato Board. Cato’s purpose is more important than both the Koch brothers and Ed Crane. 1. Get rid of the shareholder structure so no one person or small group has control over Board appointments. 3. Thank Ed Crane for his service. I look forward to continuing my support for Cato when these issues are resolved in a responsible way. I am a long-time supporter of Cato Institute. The Koch brothers, although major supporters of Cato, seem to be quite partisan, but Cato presidents Niskanen and Crane have always been intellectually honest. I’m not willing to stand by and wait to see what the Koch brothers will do to Cato. I reject their arguments, and will help maintain Cato as currently operated in any ways I can. Mr. Healy, I’m not sure I follow your logic. You state that one doesn’t go against human nature and “forget who it is that butters their bread.” If that follows, couldn’t someone just as easily suggest that cato staffers are simply carrying water for Ed Crane and in general only go along with things he apporves of? After all, they all get their ‘bread buttered’ by Mr. Crane. I don’t think that’s true, but that seems to be the argument you are making. Does Gene Healy, a Vice President at Cato, just call ’em like he sees ’em, without consulting Crane and Levy? Does Gene Healy ‘act independently’ of Ed Crane? Maybe you don’t, which would be disappointing. But if you, and other Cato staffers are able to think and act independently of the person that ‘butters your bread,’ then I wouldn’t assume that others can’t do the same. Cato’s positions, on both fiscal and social matters, have fit my political thoughts better than any other source I have found over the past several years. I like the independent thought and positions of Cato speakers much better than the political partisans on either side of the political spectrum. It has been very comforting to me to find an organization that so closely mirrors my way of thinking. It would be a tragedy if it became a partisan mouthpiece. That would make me flee from it. FA Harris, you’d have a very good point, except that the current dispute is between who is buttering the bread of Cato staffers this week and who may easily be in charge of the butter next week. The prudent thing for Cato staffers to be doing is keeping quiet, and I don’t begrudge anyone who makes that choice. Those among the current Cato staff who have chosen to criticize Koch’s efforts have done so at significant personal financial and professional risk. It is obvious to me a non contributor unaffiliated casual on looker that as much as the reasoning goes towards the Koch’s assertions the damage done by this conflict has and possibly continues to damage the Cato image. I suggest the Kochs retire from the board and organise themselves into creating a viable political party disengaged from the Libertarian yoke which has been a party of ridicule for god knows how long. Even with all the money and hype the Cato has failed in its primary purpose which was to persuade the common people that a Libertarian viewpoint would defend their freedoms. Obama was the closest you ever came to having a Libertarian president and nobody including the press cares that he has turned into George Bush the 3rd. The one and only hope you have left is Ron Paul running as an independent against Obama and Romney. If he fails the Cato may as well close its doors. Better the Kochs leave now and take on the mantle of Sheldon Adelson for Mr. Paul while there is still time. Failing that the Kochs could always start up something totally new that would be of help in a non intellectual pursuit of freedom. Tomorrow Sir Richard Branson will be discussing with the editor of the Globe and Mail questions put to the paper by readers regarding Sir Richard’s stance against the War on Drugs. I’m sure some thing there must be of interest to them where they could possible join forces with him and do something real for a change. The Koch dance is fascinating but it is obvious that they seek control for their own purposes and not Cato’s mission. BTW, “someone’s bread and butter” is the idiom for beholding and “butters their bread” is purely sexual reference. Bernard Palmer, you are a very confused man! “Obama was the closest you ever came to having a Libertarian president and nobody including the press cares that he has turned into George Bush the 3rd.” Do your due diligence and vetting of Obama. He is a Marxist not a Libertarian! They are polar opposites. Marxists want central control while the Libertarian is for freedom and liberty so the individual can have control of their own life and destiny. You must be an Obamatron that was screaming Halliburton, Halliburton, a few years ago and now are crying out Koch Koch. If your Marxist happens to, God forbid, win again even the true believers and useful idiots will see the true Obama. Many have seen through the false rhetoric and empty suit for years. WAKE UP!!!!!! !